History is new again, our past is woven of fabric with which we drape ourselves in the present. 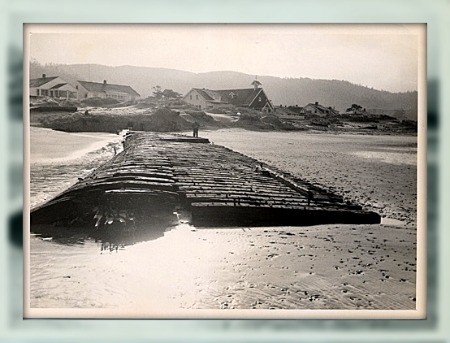 Oregon’s history is present on its beaches, usually hidden in the sands or beneath the churning waves. The Peter Iredale’s familiar, decreasing silhouette is a landmark on the north Oregon coast near Fort Stevens. Now, you can also view the Emily G. Reed, wrecked in 1908. After 35 years of obscurity, she’s back. “According to (witness to the shipwreck Elmer) Allen, the American sailing ship Emily G. Reed, bound for Portland, was 103 days out from New Castle, New South Wales, carrying 2,100 tons of high-grade Australian coal. She lost her bearings and hit a sand bar on what was Garibaldi Beach, now Rockaway Beach, south of the entrance to Nehalem Bay. Seven men lost their lives in the wreck. The captain, his wife and four of the crew drifted ashore clinging to part of the ship’s cabin. Some of the crew, not knowing where they were, decided to chance swimming ashore, tying a rope to the wreckage. When they jumped overboard, their feet touched bottom and they were able to walk ashore. Reports about the incident said four other men, who also could have walked to safety, took a lifeboat and were carried out to sea. They landed at Neah Bay, in the Juan de Fuca Strait, more than 100 miles to the north. The Emily G. Reed was built in 1880 at Waldoboro, Maine. She was a full-rigged wooden sailing schooner, 215 feet long.